The Only Thing That Stops A Bad Guy With A Gun Is A Good Guy With A Gun? This is album is ‘free’ in the original sense of the word. The rules have been rejected yet making music is still the goal. And thanks to some excellent players, a combination of composed pieces and group improvisations (and probably some fine editing too) music is definitely the result. Dense music, with a lot of moods, a lot of sounds, a lot of layers. 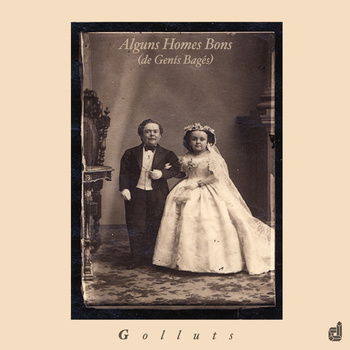 My Catalan is sketchy but let’s say Alguns Homes Bons translates as ‘a few good men’… and “golluts” seems to refer to a community of nineteenth century Pyrenean pygmies whose stature (and other physical features) was likely a result of goitre and other maladies. As soon as I work out the symbolism behind this choice of title and cover art, I’ll let you know! “Morayta” (undoubtedly a reference to the historian who wrote about the ‘golluts’) is a beautifully chaotic, almost slapstick group improvisation. After the initial clatter, Mas’ alto meanders freely while Padrós’ trumpet buzzes in the distance, creating a deceptively bucolic mood which is promptly shattered by the raucous arrival of drums, bass and guitar. The second track, “Rinoceró”, seems very firmly rooted in the 60s; a combination of the early free jazz experiments (avoiding Coltrane’s ‘shock and awe’ style) and some of Blue Note’s edgier 60s stuff (think Dolphy, Grachan Moncur III, etc.) but given a modernist edge with added distorted guitar textures. There’s a lot packed into 15 minutes here, including some nice Miles-ish muted trumpet tones that momentarily evoke the dark, rain swept streets of Paris or New York. Add in the obligatory drum and bass solos, and this is very much the band’s showcase piece. Incidentally, Bagés and Reviriego make a very tight rhythm section and the anchor they provide goes a long way to preventing the whole thing spiralling off in aimless noodle-land. Instead, the vibe is both exploratory and controlled, with a strong sense of connection and co-ordination. The philosophically-titled, “The Only Thing That Stops A Bad Guy With A Gun Is A Good Guy With A Gun?” serves up a more contemplative mood, practically minimalist in its carefully considered notes and tonalities. It’s not surprise that “La mirada del tub” is Marcel Bagés’ composition, being mainly two minutes of deliciously ornamented feedback, culminating in a wall of distortion that segues neatly into the faux-heavy metal rasp-riffed intro of “Vamos a tomar un pequeño descanso” – one assumes that the ‘little rest’ referred to in the title is ironic as this one bludgeons the ears… in a good way. “Mother Ese (per l’Arlet)” gives the horn-players a chance to show off some extended technique as the bass leads everyone in a lurching and abstract dance. The album is bookended with a final group improvisation, “La bellesa de l’horror” which in its rapid-fire interjections carries a faint ghost of Mingus’ album Pithecanthropus Erectus while remaining an expression of five distinctly contemporary Catalan musicians. It’s a diverse album and there’s something for everyone… yet, it’s not about the individual brushstrokes, more the overall picture – the tightness and interplay give it a cohesive feel in which a single unit is exploring different themes, moods, textures and styles, and eras in a direct line from then to now. Or to put it another way, I downloaded this weeks ago and I’m still playing it, and finding something new every time. “Golluts” by Algun Homes Bons is available from Discordian’s Bandcamp page.